Lettered prominently on the steeple of the landmark Elbe Lutheran Church is "Ev. Luth. KIRCHE" (Evangelische Lutherische Kirche), a reminder of the founders' German origins. and tranquility to residents and tourists alike. Beginning in 1893, worshipers met in homes and the town hall until the church was constructed in 1906. A founder of the town, Heinrich Lutkens, donated the land and material for the church. Pastor Karl Kilian designed this simple yet pleasing building, and the townspeople built it themselves. Pastor Kilian served his Elbe flock from 1906 to 1933. Dr. Ervin E. Krebs conducted the research that led to the church's placement on the National Register of Historic Places in 1976. 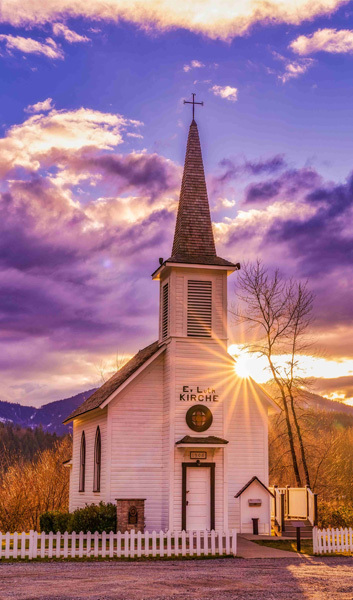 Experience the simple charm of this tiny church where "time meets eternity." Worship services are held at 2:30 p.m. on the third Sunday of the month from March through November. Please join us if you are in the area. Open during the summer for tourists, the church is also a popular place for weddings. If you're interested in having your wedding here, please contact our wedding coordinator Peggy McNamara , peggymcnamara@outlook.com, 425-213-4127. Volunteers care for the Elbe Ev. Kirche, relying on donations to maintain this historic church building. All contents of this site are copyright 2009, The Historic Elbe Church and may not be reproduced in any form without consent.